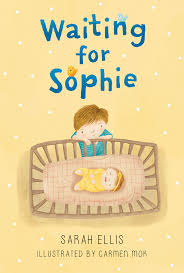 "Sophie was small, but she was heavier than Liam had expected. He was very careful with his feet when he carried her through the door. He put her on the couch and unwrapped her like a present. She was practically perfect. She had toes like peanuts and ears that the sun shone through. The top of her head smelled especially nice. She smiled at Liam and held onto his finger." Sarah Ellis is such an accomplished writer. She constantly writes strong stories that have lasting impact for her audience. Many remain on my 'keepers' shelf to now be shared with my granddaughters. If you haven't shared her wonderful books about Ben and his family, be sure to check them out. In this early chapter book, she introduces us to Liam and his family. Upon meeting him we learn that his parents have gone to the hospital in hopes that baby Sophie will soon arrive. Liam is super excited, but wants everything to happen now! smithereens and flush it down the toilet." Nana-Downstairs does her best to offer up solutions to help with all that waiting - being bad might help. After a day filled with doing those things not usually allowed, they learn that Sophie will be home the next morning. Once home, he makes other unexpected discoveries. Mostly, he begins to understand that it will be a long time before Sophie is his daily playmate. In the meantime, he will do all he can to care for her ... and wait! Even the Get Older Faster Machine that he builds with his Nana doesn't seem to help Sophie grow up. Change takes time, even for older brothers. Sarah Ellis tells another timeless story with beautifully chosen text and Carmen Mok matches the tone of the story perfectly with gentle images and soft colors. "Hush, little baby, don't cry a bit. Liam's going to make you a banana split. If that garbage trucky gets stinky ... "